is a locally owned and operated commercial & industrial laundry since 2003, who take pride in providing service our customers can count on. With the capacity to wash 2,000lbs (180 rooms ) of linen an hour, we are more then capable of handling your laundering needs. We have multiple backup redundancies in our process to ensure our downtime does not affect your hotel. Because we`re local, Because we care! Every member of our team is a laundry expert creating a process. We strive to be a complete solution provider and we want to know our customers because we understand that they are where our success is created. Our friendly, can-do attitude paired with the fact that we are right here in your community, allows for a customer service experience second to none. At Fabriclean Laundry & Uniforms Ltd. we understand the importance of our environment and our resources. We encourage responsible behavior from both our employees and our suppliers. Recycling done by our hot water system lowers energy consumption as recycled water is easier to heat than fresh water. Our laundry is large scale. This means less energy, water, and detergent usage compared to doing laundry in an at-home or in-business situation. We also offer our customers eco-friendly options, from paper towel to mats and uniforms made from recycled materials; together we can make a difference.ibly good. Fabriclean Laundry & Uniforms Ltd. is located right here in Kamloops BC, from the building to the staff to the owner, we are a part of this community. That means we are your neighbor and we care. It also means that the money spent on our services actually stays right here in our community! 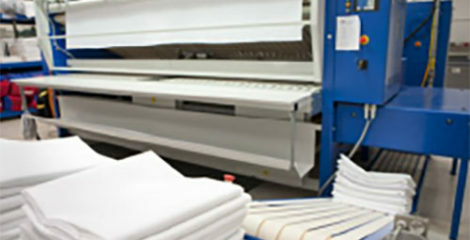 Every member of our team is a laundry expert creating a process that is unique. We strive to be a complete solution provider and we want to know our customers, because we understand that they are were our success is created. Our friendly, can-do attitude paired with the fact that we are right here in your community, allows for a customer service experience second to none.